America is experiencing an affordable housing crisis as more families have trouble paying rising rents. The dark side of this crisis is an epidemic of evictions. 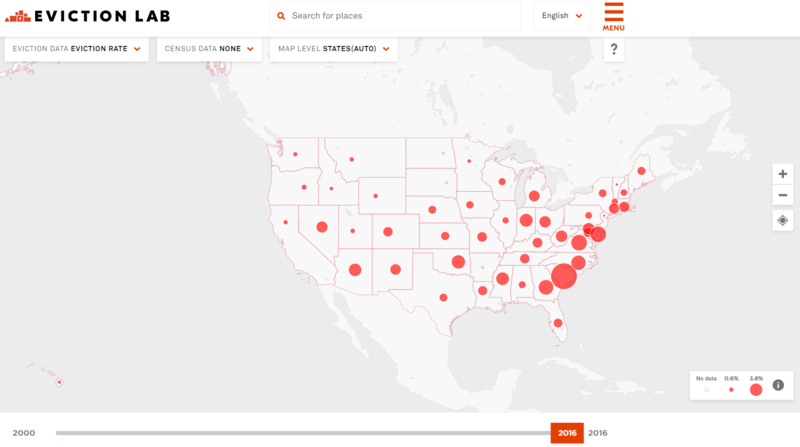 Last year, Princeton University published the first database of evictions in the U.S. This data is intended to be used to discover new information, raise awareness, and help find solutions to our housing crisis. The data shows that there were nearly 900,000 evictions in 2016, resulting from 2.3 million eviction cases filed. Eviction rates were highest in the South and the Industrial Midwest. Higher eviction rates were also found in areas with larger concentrations of minority households. The eviction data was compiled by the Eviction Lab, founded by Princeton Sociology Professor Matthew Desmond. The Eviction Lab’s database contains records of 83 million court records dating back from 2000, and is updated quarterly. At an Urban Institute discussion about the eviction database last year, Professor Desmond highlighted regional and racial differences in eviction rates. The data show eviction rates are much higher in the South than the large cities on the East and West Coasts. Although housing costs are much higher in the large coastal cities, incomes are lower in the more rural areas of the South. The data also shows that while the big cities often have larger numbers of evictions, medium cities, small cities and rural areas often have higher eviction rates. While New York City had the highest number of evictions in the country, it had a 2016 eviction rate of only 1.6%. By contrast, the eviction rate in Richmond, Virginia, was 11.4%, or 1 out of 9 renter households in the city. Professor Desmond said that high eviction rates are most closely related to poverty. This explains higher eviction rates in small cities and rural areas in the South with lower incomes and fewer tenant protections. High eviction rates are also closely tied to race. In the South especially, majority African-American counties and neighborhoods have very high eviction rates compared with neighboring majority white counties. Larger numbers of African-American households in these areas are renters, and larger numbers have low incomes. Eviction rate by state in 2016. Courtesy of The Eviction Lab at Princeton University. For low-income renters, housing stability is very fragile. A sick child, job layoff or car breakdown can mean missing rent payments. The State of the Nation’s Housing 2017, an annual publication of Harvard’s Joint Center for Housing Studies, notes that a large number of renters, especially those with the lowest incomes, pay too much for their housing. More than 48% of all renter households were cost-burdened in 2015. This means that they paid more than 30% or their income for housing and utilities. People who pay more than half their incomes for housing are severely cost-burdened. More than 70% of renter households with the lowest incomes were severely cost-burdened in 2015. These are households that earn 30% or less of the area median income. There are few apartments available that are affordable to those with the lowest incomes. According to the National Low Income Housing Coalition (NLIHC), there is a shortage of 7.2 million apartments affordable to these households, or only 35 affordable apartments available for every 100 extremely low-income renters. Nowhere in the country can a person making the minimum wage afford the HUD Fair Market Rent for a modest apartment. The Eviction Lab website has an interactive map where users can find eviction rates for their local areas. Custom maps can be created that merge the eviction data with Census information, like poverty rates, rent burden and racial demographics. It also provides rankings of communities in each state. The Eviction Lab database has some limitations. It only includes cases where landlords sued for eviction in court, not cases where tenants moved after being asked by landlords. There are also areas where information is limited, and the Eviction Lab is working to get more local jurisdictions to make their records available. Eviction is not just a condition of poverty, it is also a cause of poverty, Professor Desmond points out. When low-income renters are evicted, they face more obstacles to escaping poverty. People not only lose their homes, but often lose all of their belongings too. 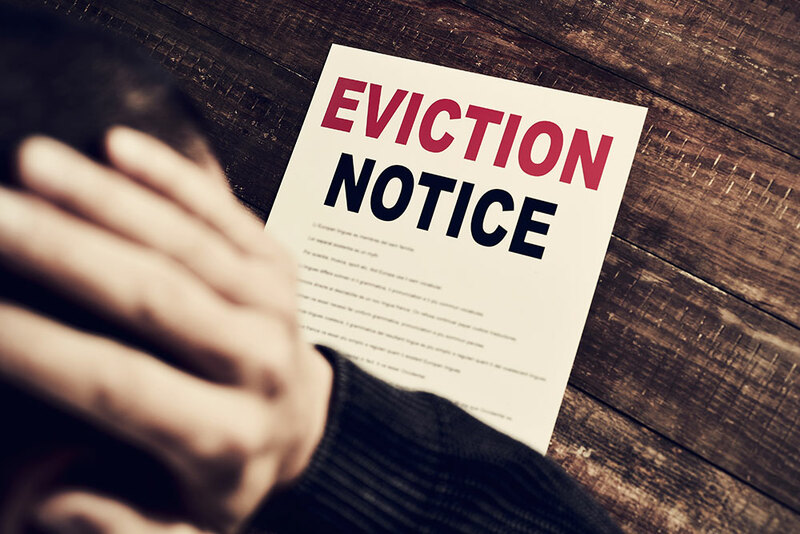 Most evictions occur for an average of a couple of months’ rent, but it can take years for a family to establish stable housing after an eviction. The work being done by the Eviction Lab is an important resource to help us better understand poverty in America, and discover solutions to the issue.